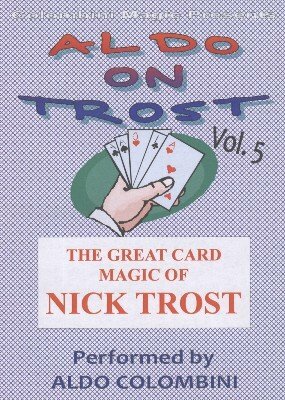 Nick Trost was a master at creating amazing tricks and routines based on subtleties rather than difficult sleight of hand. SIGNIFICATOR CARDS: A freely selected card is lost in the deck and revealed by four cards picked by a spectator. THE RESTLESS COURT CARDS: The twelve court cards are used. You place them in three packets and then switch their positions. They follow each other in their respective piles. AN EQUALIZER REVEALMENT: Two cards are freely selected and replaced. The deck is shuffled face up and face down and at the end all the red cards are face up except the black selection and vice-versa the black cards are face up except the red selection. THE AUTOMATIC GAMBLER: Some cards are shuffled by you and the spectator. Three hands are dealt and your hand beats the other two. IT’S A DATE: A coin is borrowed and left in full view The deck is shuffled and cut by a spectator and four cards are selected. The four cards reveal the date of the coin. SPECTATORS’ DOUBLE MATCH: The deck is divided in half and two spectators each take a half-deck and pick two cards. They match. The same thing is repeated with the same result. THE ROYAL TREATMENT: The four Queens are paired up with the four Kings by a spectator, and they all match (Hearts with Hearts, Clubs with Clubs, etc.). COINCIDENTAL CUT: A spectator cuts any amount of cards. Two cards are selected from the remaining of the deck and they indicate the cards cut by the first spectator. FOURTEEN-CARD FOLLOW THE LEADER: The classic theme, the easy way, THE Nick Trost way. DOUBLE CATO REVELATION: A sixteen-card packet is shuffled by a spectator after two cards have been chosen. At the end, the two cards appear in the opposite color pile.